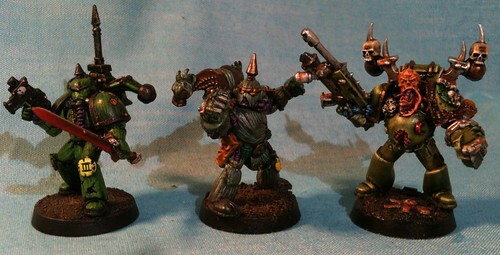 My picks for the top five Nurgle Chaos Space Marines sculpts of all time. As well as a few also-rans from my collection. Other people keep doing it and who is more qualified than me, I’ve painted just about every plaguemarine or Nurgle renegade sculpted by GW and some I’ve painted many times. Other people when they do this seem to use photos from GW, what gives with that? 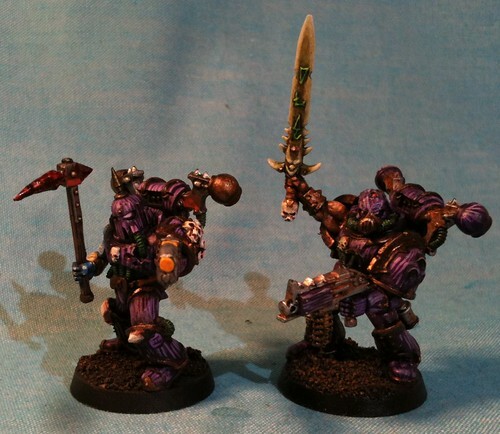 What is the point of having a miniature painting blog and putting up pictures of models you didn’t even paint. How can you be so sure if it is an awesome sculpt if you’ve never had the model in your hands, let alone had the model in your hands for hours while you paint it. I believe this model is called “Nurgle Renegade with Plaguebearer Head”. I own exactly one of these models. I stripped it and repainted it. The second paint job was done in Japan with a very limited palette. Folks these days don’t realize how good they have it with their websites, their mail order, their 100s of different colors to choose from, their specialty bits manufacturers. This model was one of the first Chaos Space Marines I bought and one of the few I could scrounge up while in high school, I converted the beginnings of my army from RBT01s and 2nd Edition box set loyalists. This model probably came in the same blister as the one above. 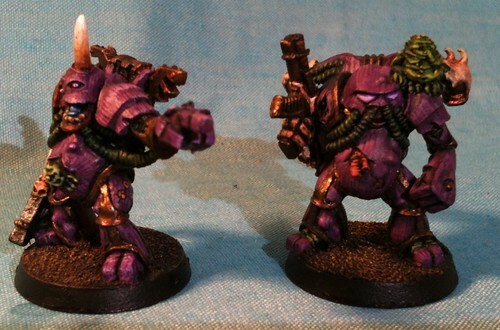 These two models probably along with the +1 Toughness encouraged me to go with Nurgle at the dawn of 2nd Edition. This model was also stripped and repainted in Japan. This is the only copy of the model I have. Looking at this page in Stuff of Legends, (someone borrowed my old catalogs and never gave them back) it appears I do have every Nurgle Renegade. I almost have every Tzeentch one shown too. This model I really liked and was able to find copies of online. I think I may own three. Two are currently painted and in my display cabinet. Dylan was unsuccessful at turning one up, but he’s found lots of old OOP models. I’m unemployed and used to live on an Island in the colonies. The fact I have several is a testament to my passion as a Nurgle collector. This model I did not strip and repaint. He must have come in a blister with one of the other Nurgle Renegades as I’ve had the model since say 1994. It wasn’t unheard of to have blisters with three or more models in them back in the day. Small models like goblins used to come several to a blister. All GW models used to be smaller and even dreadnoughts and bikes came in blisters. Picking the final model was tough. Every model I picked was basically released before I started playing the game almost. Models were just more desirable and harder to come by back then. You had to save and make a pilgrimage to GW Gastown, then you had to hope they had what you wanted in stock. I back filled my collection in the mid to late 90s as I traveled across Canada doing co-op work terms. I’d always hunt through old blisters and I ordered a bunch of stuff as it went out of print or traded for it after it was OOP. That said all my favourite models I acquired new when the Diseased Sons were starting out, way before nurgle.muschamp.ca. 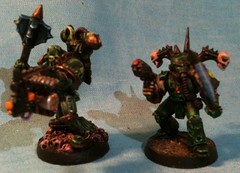 There have been a number of Plaguemarine Champion miniatures. There were two released for 2nd Edition. I used one as a general and the second as a special weapons trooper. There was a special champion that came with the metal Plaguemarine havoc box set, which I converted to be an icon bearer and there is even a champion or at least helmetless model that comes with the Forgeworld Death Guard upgrade kits. I like a lot of these armless models, but I think from a miniature sculpting point of view, the models that have the most personality generally come in one piece and historically are made of metal. 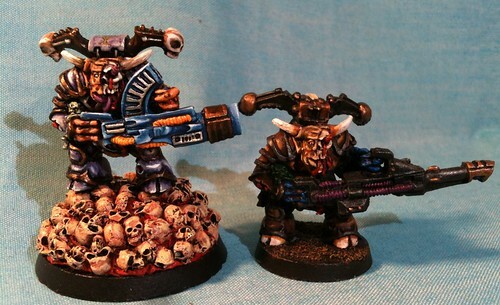 So I chose the Plaguemarine Champion with Plasma pistol, the one sighting along his weapon with his breather hanging loose. I like the guy with the blue face best. I’m big on blue faces for Chaos Space Marines. I’ve tried other colors and blue looks best with green, purple, black, even red power armor. A lot of the best Nurgle sculpts were actually Warhammer Fantasy Battle ones which can be incorporated into a 40K army through conversion or daemonic allies. One model I still have to repaint is my original Chaos Magus, Cancerous the Extremely Naughty.